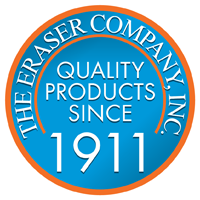 All of Eraser’s wire stripping wheels are manufactured in house to ensure the highest standards of quality and delivery. We make stripping wheels to fit competitive machines as well as for all Eraser models. We can also manufacture custom size wheels. There are many factors that determine the proper grade of wheel for a specific wire stripping application and these include: wire size, type of insulation, strip length, number of wires stripped at one time, etc. For this reason, we suggest you send a sample of your wire so we may test it in our laboratory to provide you with the most efficient and economical grade of wheel. Select your machine from the list below: R1S D1 DV1 D9 PD9 PD2S E200 Don’t see your machine listed? Contact Us! 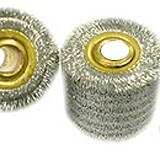 The .0118 Very Coarse Wire Stripping Wheel is sold singularly and 2 are required for use in the E200. All of our Wire Stripping Wheels are manufactured in house to ensure the highest standards of quality and delivery. We make stripping wheels to fit all competitive machines as well as for all Eraser Models. We can also manufacture custom size wheels. There are many factors that determine the proper grade of wheel for a specific wire stripping application. These include wire size, type of insulation, strip length, and number of wires stripped at one time. For this reason, we suggest you give us a call, to determine the proper grade for your application. The .014 Extra Coarse Wire Stripping Wheel is sold singularly and 2 are required for use in the E200. All of our Wire Stripping Wheels are manufactured in house to ensure the highest standards of quality and delivery. We make stripping wheels to fit all competitive machines as well as for all Eraser Models. We can also manufacture custom size wheels. There are many factors that determine the proper grade of wheel for a specific wire stripping application. These include wire size, type of insulation, strip length, and number of wires stripped at one time. For this reason, we suggest you give us a call, to determine the proper grade for your application. The .016 Nylon Comb Wheel is sold singularly and 8 are required for use in the D-Series. All of our Nylon Wheels are manufactured in house to ensure the highest standards of quality and delivery. We make wheels to fit all competitive machines as well as for all Eraser Models. We can also manufacture custom size wheels. There are many factors that determine the proper grade of wheel for a specific wire stripping application. These include wire size, type of insulation, strip length, and number of wires stripped at one time. For this reason, we suggest you give us a call, to determine the proper grade for your application. The .006 General Purpose Fine Wire Stripping Wheel is sold singularly and 10 are required for use in the D-Series. All of our Wire Stripping Wheels are manufactured in house to ensure the highest standards of quality and delivery. We make stripping wheels to fit all competitive machines as well as for all Eraser Models. We can also manufacture custom size wheels. There are many factors that determine the proper grade of wheel for a specific wire stripping application. These include wire size, type of insulation, strip length, and number of wires stripped at one time. For this reason, we suggest you give us a call, to determine the proper grade for your application. The .008 General Purpose Coarse Wire Stripping Wheel is sold singularly and 10 are required for use in the D-Series. All of our Wire Stripping Wheels are manufactured in house to ensure the highest standards of quality and delivery. We make stripping wheels to fit all competitive machines as well as for all Eraser Models. We can also manufacture custom size wheels. There are many factors that determine the proper grade of wheel for a specific wire stripping application. These include wire size, type of insulation, strip length, and number of wires stripped at one time. For this reason, we suggest you give us a call, to determine the proper grade for your application. 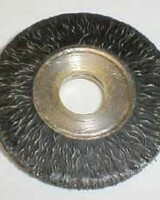 The .0118 Very Coarse Wire Stripping Wheel is sold singularly and 10 are required for use in the D-Series. All of our Wire Stripping Wheels are manufactured in house to ensure the highest standards of quality and delivery. We make stripping wheels to fit all competitive machines as well as for all Eraser Models. We can also manufacture custom size wheels. There are many factors that determine the proper grade of wheel for a specific wire stripping application. These include wire size, type of insulation, strip length, and number of wires stripped at one time. For this reason, we suggest you give us a call, to determine the proper grade for your application. 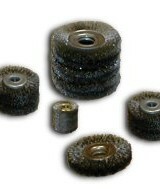 The .0118 Very Coarse Encapsulated Urethane Stripping Wheel is sold singularly and 16 are required for use in the E200. Encapsulated brushes use an elastomer which firmly supports the individual wire tips, producing stronger brushing action and longer life. In use, the elastomer wears back gradually, presenting a shorter wire tip for maximum cut. These wheels can be used singly or mounted in multiples to create a wider brushing face. We make stripping wheels to fit all competitive machines as well as for all Eraser Models. We can also manufacture custom size wheels. There are many factors that determine the proper grade of wheel for a specific wire stripping application. These include wire size, type of insulation, strip length, and number of wires stripped at one time. For this reason, we suggest you give us a call, to determine the proper grade for your application.